Great tool, unfortunately the -path parameter isn’t recognized which means it isn’t possible to select the PATH from the command line (non gui) version. 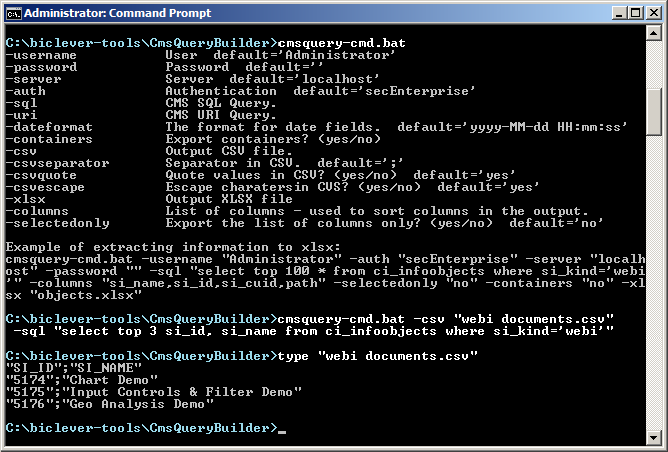 cmsquery-cmd.bat -sql "select si_name from ci_infoobjects where si_kind='webi' and si_instance=0" -csv "webi.csv" -path "yes"
Thanks, this now works! Another nice to have option would be the ability to select single columns from containers. Right now it’s only possible to select the whole container (e.g. SI_FILES) and not a single column from a container (e.g. SI_FILES.SI_FILE1). Furthermore, maybe you can also store the last picked options for ‘Include path’ and ‘Include containers’ in the cmsquery.cfg file. cmsquery-cmd.bat -sql "select SI_CUID, SI_FILES from CI_APPOBJECTS" -containers "yes" -columns "SI_CUID, SI_FILES.SI_FILE1" -selectedonly "yes"
it is getting the document IDs but I want to include the name of the WebI Report along with the Category. Interactively it returns 12304 occurrences of SI_ID but only 1000 rows are generated in the Excel output. Is the amount of data that can be exported to Excel limited to 1000 rows? Thanks that solved it !